>In teacher school, one of the major buzzwords was “reflective” teaching. The idea behind this is that teachers should be continuously thinking about what they are doing in the classroom and changing what isn’t working. This way, teachers don’t get stuck in that rut of just recycling the same assignments year after year without adapting them to the students’ needs. While I can get in teaching ruts, I think I’m pretty good at being reflective. I rarely do the same exact thing twice. I’m always changing things up and trying to improve my craft. I also try to apply this to my life outside of teaching. That’s one of the reasons I love therapy so much. If something is bothering me about my life, I make a mental note and bring it up at therapy. This usually leads to me making changes about how I act and react in certain situations. For example, one thing that I’ve noticed about others and myself, is that we say we’ll do something and then complain about it. Yes, I will babysit but, oh I wish I was doing x instead. Or, yes I’ll go to that fancy dinner, but oh I really can’t afford it. Since I can’t change how other people make choices, I’m just going to change how I do. If I’ve been really looking forward to my yoga class and someone asks for a favor that would prevent me from going, I politely say no. If there’s an event that I’d love to be a part of, but I just can’t afford it, I nicely decline. If I said yes to these things, I wouldn’t be able to stop myself from complaining and that’s not pleasant for anyone involved. I don’t believe this is selfish of me, but I can see that someone might think that it is. Oh well for them! That’s something else I’m working on: oh well! I’m trying to stop myself from getting so worked up about what others do or think or say. I need to worry about them less and focus on my reactions. Oh well is now my new mantra. I’m far from perfect and I’m not striving for perfection. I’m just trying to be the best “me” that I can be. I know that I can change because I’ve done it so much lately. I also know I’ve never be done reflecting and changing. Her colors are red, orange, and yellow. 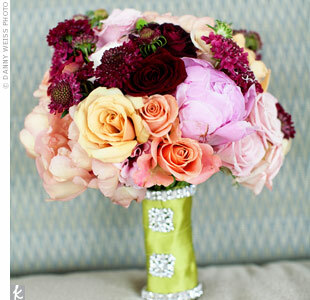 I think this bouquet is a lovely twist on that fall palette! ← >Here’s to our health! >We were just talking about a similar topic on our drive home this evening. Thanks for posting…good thoughts and something we could all do more of!